BFF 2019 welcomes more than 80,000 attendees and spreads over Downtown Bentonville for 5 days, May 7-11. BFF 2019 expands to Fort Smith and Eureka Springs for screenings and filmmaker events. The Festival map includes theaters, venues, and shuttle stop details you’ll need for BFF 2019. 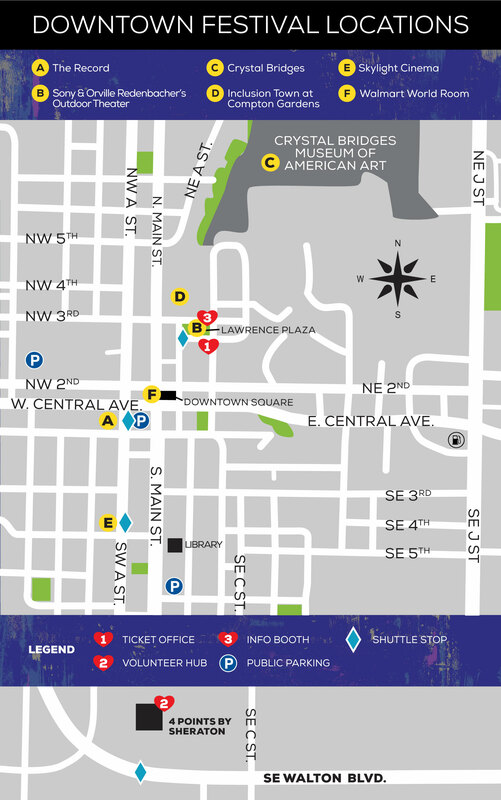 Most of the festival is walkable, but for parking, your printed map is located in the printed Film Guide with parking areas clearly marked. Check out the mobile app (Apple Store, Google Play) for an up-to-date look at BFF 2019! Getting to BFF is simple. Northwest Arkansas Regional Airport connects to 4 airlines serving 15 non-stop destinations. From the free Festival shuttle to car rentals, Lyft pickup, and private car services, navigating BFF is easy. Both Uber and Lyft operate in Bentonville. Daily Shuttle Service will run every 20 minutes between Lawrence Plaza, Sheraton Four Points, The Record and Skylight Cinemas. Tuesday: Sheraton to 21C and back only, 5PM-11PM. There are many free parking lots available within walking distance of Bentonville Square. For a map of locations, go to www.visitbentonville.com/plan-your-trip. Bentonville Film Festival is proud to partner with the Visit Bentonville. From the fresh air of the Ozarks, to the world-class Crystal Bridges Museum, arts, culture and cuisine are at the heart of Bentonville, AR. Check out Visit Bentonville for everything to do between events at BFF. BFF Competition films, blue carpets, and special screenings are taking up residence in Record North for BFF 2019. This year, all Discussion Events, presented by MARS, are located in the Main Ballroom. Be sure to check out The Hive lounge for a bite to eat! Experience BFF Competition Films in the Walmart World room. Enter through the Walmart Museum and head to the third floor. Enjoy outdoor screenings all festival at Lawrence Plaza, courtesy of Sony and ConAgra. Relax and enjoy the filmmaker lounge at BFF – the perfect space to network with industry leaders, sponsors, and talented filmmakers! Open to Filmmaker, Juror, Screener, Sponsor, and Foundation Badge holders as space allows. This venue has limited seating. Visit the BFF Box Office at 21C Museum and Hotel during the festival from 9am-5pm Tuesday-Saturday to pick up tickets. Tickets available here via the website, and be sure to download the official BFF App for the full festival schedule on the go.